The dollar goes up and down and yet…life goes on. His case study is about leading Republicans’ idea for replacing the corporate tax with a sales-based, border adjusted tax, or the BAT I recently wrote about. The tax code has been flawed and inefficient for a very long time, precisely because fixing it could be so terribly disruptive. In a nutshell, the corporate tax issue provides an excellent case study of the problem of “path dependency” in public policy. The United States might well have a better, more efficient tax code today if, starting a century ago, lawmakers had designed it so that businesses were taxed on where their sales and expenses take place, as the Republicans’ plan calls for. But that is not what happened. Instead, lawmakers took what seemed to be a logical approach: They focused on taxing businesses on their profits. Today, that choice shapes arrangements in every corner of the economy. It affects the values of currencies and financial assets. Every business has devised its structure and organization to maximize its advantage within the existing system. Hmmm. 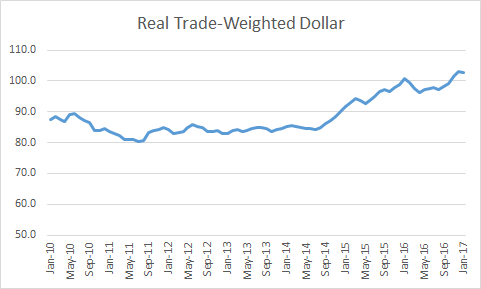 In fact, as shown in the figure below, the real value of the dollar compared to the currencies of countries with which we trade is up almost that much since 2014, and while there have certainly been consequences, they’ve not been enormous and clearly haven’t derailed the expansion (a sudden, large appreciation could be a bigger deal, but I don’t think that’s a realistic reaction to the BAT). No question, the stronger dollar has dampened inflationary pressures, and has thus influenced Fed policy. Very importantly in today’s political climate, it raises the costs of our exports and lowers the cost of imports. Thus, it is a factor in the trade deficit, which has gotten more negative since the appreciation shown above. That, in turn, has contributed to weak factory employment, down 46,000 over the past year, surely an undesirable and important outcome. But the recovery has proceeded apace over this period, which itself was one reason that the dollar strengthened. We’re growing faster than other advanced economies and contrary to theirs, our central bank is in interest-rate-raising mode, which also strengthens the dollar. All of which is a problem for team Trump, of course, as per the trade deficit point noted above. And, of course, who knows how much the dollar would appreciate in reaction to the introduction of the BAT? I’m sure it would appreciate somewhat, but I don’t believe the immaculate/immediate full appreciation story (i.e., I don’t believe the dollar would immediately appreciate enough to fully offset its impact on imports). But getting back to Neil’s discussion of the BAT: while I’m concerned about various aspects of the proposal—higher costs of imports for low-income households, the too-low rate (see point #4 here), the inconsistent revenue estimates (if the tax reduces the trade deficit, then the revenues it generates fall)—it’s worth recognizing that the dollar goes up and down all the time, and its consequences are not necessarily that disruptive. What you want to worry about, and I worry about it a lot, is a systematically 0vervalued dollar due to currency interventions by trading partners who want a competitive edge over us. And with that, let the weekend begin! Share the post "The dollar goes up and down and yet…life goes on." 4 comments in reply to "The dollar goes up and down and yet…life goes on." The Republican plan starts with a major breakthrough in moving to a destination based corporate tax that taxes profits where the product is consumed. That change is long overdue. And the disruption would just be to the Multinationals that would at last pay their fair share. A price we should be more than willing to pay! Many states realized this and so tax where the product is sold. If 17% of a companies sales are in California then California taxes 17% of the company’s profits. If the U.S. followed this destination based tax it would raise about $550 billion over 10 years. Unlike the Republican plan it would not be disruptive for most companies and the economy. More information is available at salesfactor.org. I believe there is a typo in your second-to-last sentence. I believe you meant to write “overvalued” instead of “undervalued”. Either that, or I am just confused. I enjoy and appreciate your writing. Thank you and regards. I’m sure it would appreciate somewhat, but I don’t believe the immaculate/immediate full appreciation story (i.e., I don’t believe the dollar would immediately appreciate enough to fully offset its impact on imports). You are correct as long as the border adjustment falls on the full value of imports, but not on exports. where a is the border adjustment (rebate) rate, c is the cash flow on which the export rebate is calculated (1> c > 0), and e is the exchange rate. (You can use the implicit function theorem if you like). Unless there is a reason for believing the that the capital account CA is going to adjust (and no one has really come up with a good a priori reason or narrative that suggests anything more than some short-term speculative movements during the transition), the exchange rate must adjust to maintain the identity. If c = 0, there is no border adjustment (no cash-flow to tax), this is a straightforward tariff. If c = 1, it’s a VAT and the exchange rate fully adjusts. Reality will be in between the two unrealistic limits. The real issue is does the DBCFT really collect taxes on stuff consumers buy here? Is it really a tax on profits or consumption? People are wasting too much time worrying about the border adjustment. Business lobbies always claim that profits taxes will just be passed along to consumers (and they are so darned worried about those consumers!!). If they really believed that, they wouldn’t worry since they wouldn’t pay the tax. So I suspect it may very well be a corporate profits tax.